A native of China, the “royal empress” tree called paulownia could rule America’s economy as a multipurpose crop. Research suggests that this fast-growing tree may help farmers establish sustainable income. 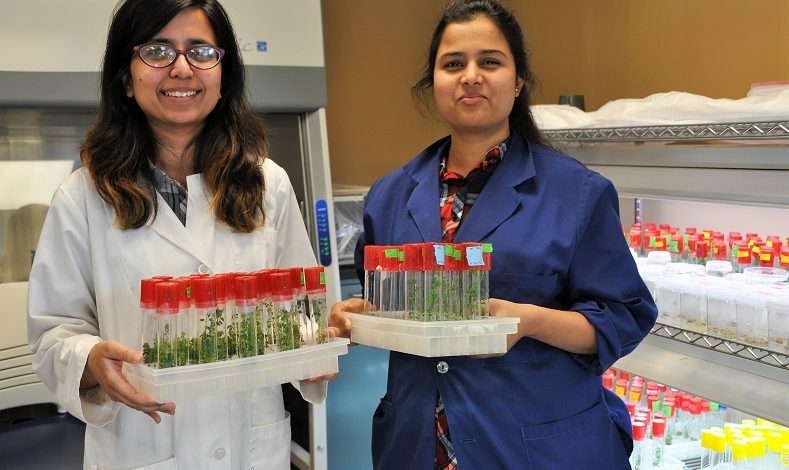 Fort Valley State University graduate students Richa Bajaj and Lubana Shahin, who are both pursuing a Master of Science in Biotechnology, are exploring two possible options. Bajaj is studying the cloning of proven elite trees from the field and genetic transformation of paulownia, while Shahin investigates flowers and leaves for tea properties. They are conducting this research on FVSU’s 5-acre research plot containing approximately 2,600 paulownia trees. Delving into the cloning process, Bajaj’s research focuses on in vitro regeneration of paulownia elongata elite trees using various tissues and growing media. Her findings could aid farmers and growers in procuring desirable plants/species for ornamental or afforestation purposes. She noted there is no documentation of this type of research on paulownia. Holding a tray of individual glassware each containing numerous green plants in transparent soil (agar-based nutrient gel), Bajaj explained how she initially took one section from a paulownia plant. “Each shoot can now regenerate into a plant,” Bajaj said. She is trying various combinations of plant growth regulators. Before transferring the shoots to the campus greenhouse, Bajaj stored the plants in a controlled environment for about two to three weeks. Expanding her research, Bajaj is also planting artificial seeds of paulownia elongata. She is storing the cultures (beads) at different times up to 20 weeks at 4 degrees Celsius and then will transfer them to a modified gel medium at 25 degrees Celsius to monitor how they regenerate. One shoot becomes multiples as paulownia elongata clones grow in transparent soil. “Synthetic seeds are stored for in vitro preservation at 4 degrees Celsius and then tested for their vitality and regeneration,” Bajaj noted. Because paulownia is a fast-growing tree, Bajaj said the major benefit of her research is forestation. Farmers could procure more trees in a shorter period. Therefore, this opens the door for multiple uses, such as timber, biodegradable products, honey production and biochar, which improves the quality of the soil. 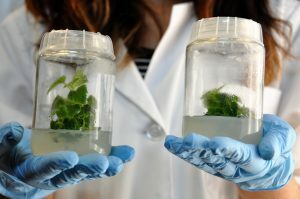 Bajaj said the most exciting part about her research is that she formulated one treatment that can work for many stages of paulownia tissue cultures. “I’m looking forward to the outcome, the regeneration potential and the viability in the greenhouse and in field conditions,” Bajaj said. An expert in paulownia research, Dr. Nirmal Joshee, a FVSU professor of plant science, said the advantage of Bajaj’s research is that she is optimizing paulownia elongata regeneration from many tissues. More interested in the delectable aspect of the versatile plant, Shahin is investigating the use of flowers and leaves of paulownia fortunei and paulownia elongata as tea. Her research could provide another avenue for farmers to market the crop. She said people in China use different parts of paulownia, such as the flowers, bark, fruits and leaves, to make tea. “There are particular genes that are responsible for the quality of tea. I’m trying to validate scientifically if paulownia has the same qualities,” said Shahin, adding that the fragrant flowers of paulownia would be a good addition as a new herbal tea for tea drinkers. First, Shahin is researching the properties of the paulownia fortunei flower using different temperatures. Resembling potato chips, paulownia fortunei flowers, once a bright purple, dry at room temperature in foil pans and on paper napkins. Standing next to a cart with several foil pans and paper napkins containing something that resembles potato chips, Shahin explained that drying the flowers is one of the processing steps to determine the best way to make tea. Drying the flowers at room temperature in different stages, she will then analyze the tissues for chemical markers and antioxidant capacity and determine which drying method is best to retain important chemicals that impart flavor and medicinal properties. “The taste of tea comes from the chemicals present in it. All of these chemicals behave in a different manner at different temperatures,” Shahin said. “It is really important if we can scientifically validate that paulownia can be made into a good tea for commercial use in the future.” Dr. Ajit Mahapatra, a FVSU associate professor of food and bioprocess engineering, is providing his expertise for this part of the study. He is serving as one of the Thesis Research Committee members for Shahin and co-principal investigator of the project. Furthermore, Shahin said paulownia could become a new revenue-generating product for farmers. “That is why I’m excited about it. I’m very hopeful,” she said. The students’ research is part of Joshee’s project titled, “Developing a Sustainable Bioenergy System: Paulownia Production for Fuel, Chemicals and Materials,” awarded by the U.S. Department of Agriculture’s (USDA) National Institute of Food and Agriculture (NIFA). 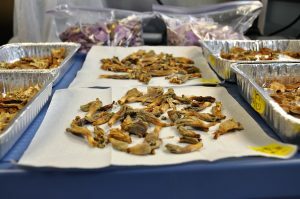 As the lead institution, FVSU is collaborating with the USDA’s Agricultural Research Service (ARS) in Peoria, Illinois, the State University of New York (SUNY) College of Environmental Science and Forestry (ESF) in Syracuse, New York, and California State University (CSU) in Northridge, California. For more information about the paulownia projects, contact Joshee at (478) 822-7039 or josheen@fvsu.edu.